Well, finallly a third post here! I keep thinking I have to have a good topic to talk a long while about for each post, but I guess shorter ones are okay too. I doubt I’ll manage to microblog (e.g. Twitter) though. Yesterday I was looking for a color while designing a book cover, and needed to find a good color to complement the one I was using in the title. I had used some great color tools in the past, free online resources that have saved me trouble when working on website templates, but couldn’t remember their URLs. I have always relied on the search engines to find them. Well, yesterday, rather than arriving at one of the tools I already knew, I got to a new (at least for me) website that I thought was very nice and did a great job: Color Hunter. 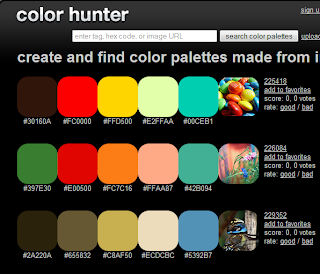 It helps you create and find color palettes made from images. I had seen other tools do just that, but for some reason, I really liked this one. I wasn’t generating a palette for this task, though, but it was still helpful because searching the color returned the palettes that website had generated from Flickr photos which had that color. Now, that is just a new find, I’ve been using another great website I had found in the past to deal with colors is Colour Lovers. It has been a great source of inspiration and solutions in this subject. This website features collections of palettes and also background patterns, created by its users. Sometimes they are very nice, sometimes not really, but its still a very cool resource to use when dealing with colors. I like that it also has a section that deals with websites and magazine covers to check palette trends, as well as a tool to create palettes. It is much more than that, too. It features a community of: color lovers, what do you know :D. Think of it as a Flickr for colors, kind of. Now, one more tip for those dealing in colors. Sometimes I need to know what the value of a color in an image or website is and I could take a screenshot or just copy the image and then open it up with PhotoShop and use its color picker tool. There is a problem with that: it takes a lot of steps to do something that should be quite simple. Enter Firefox‘ add-on ColorZilla. This thing makes it very simple to pick any color being displayed in the browser. Its just is as simple as PhotoShop’s, so there is hardly a learning courve. I love saving myself all the steps I needed to go through before, including having to launch the damn application which gets heavier with every release. I guess that’s enough for this post. Now that I mentioned the Firefox Add-on, I felt tempted to start listing other graphics related add-ons I find helpful, but I’ll restrain myself for the time being and probably take them on in a future post. Hopefully you found this information useful. This entry was posted in Uncategorized by clavaque. Bookmark the permalink. Good tips from you, as usual!